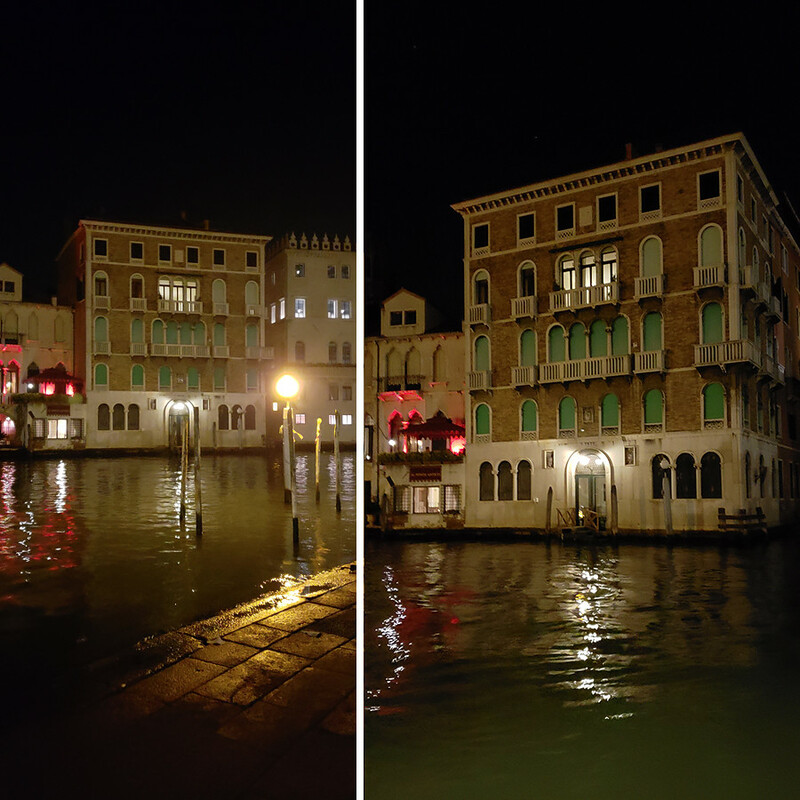 We arrived in Venice at night. You’ll have to excuse the blurriness of my photos but you know, there was a lot going on and I didn’t exactly have time to set up a tri-pod. It was magical. 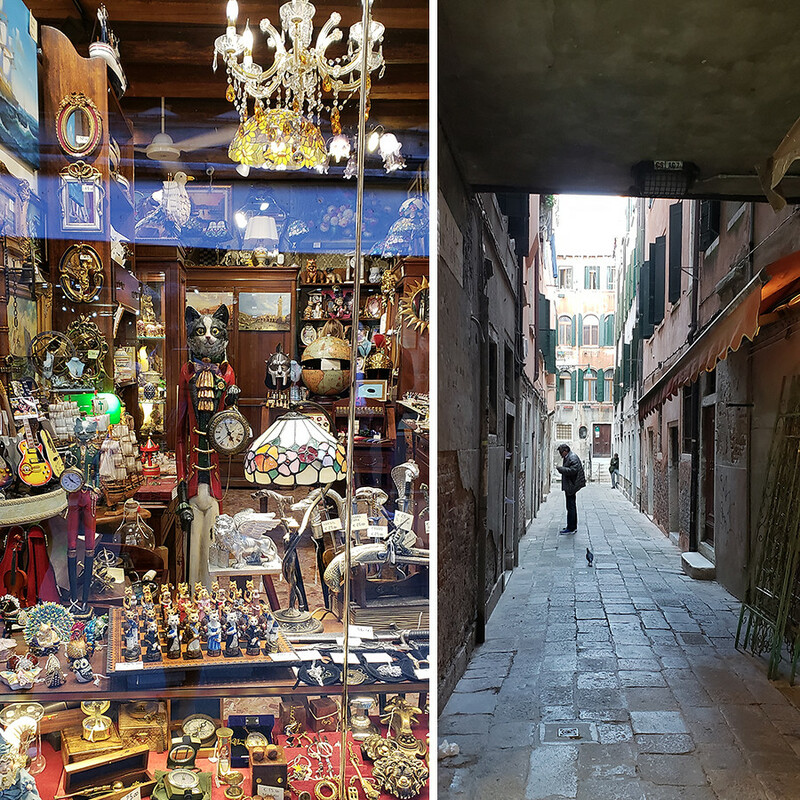 It’s a huge insult to say this but the closest thing I could think of to compare Venice to in my very small exposure to the world was that it felt like being on the Pirates of the Caribbean in Disneyland. That’s how surreal everything felt. I half expected the lights to come on at some point and I’d see ceiling panels in the ceiling. But there was no ceiling. We weren’t on a set. It was real. It’s a really weird feeling, being in a village full of lights and surrounded by water on all sides. Water at night is just a creature all it’s own. Ask anyone who’s ever taken a cruise and gone out on top of the boat in the middle of the night. It is vast and creepy but also beautiful. Everywhere you looked there was water. Water was in place of streets and sidewalks. We caught a water ferry and slushed away off to our hotel for the night. 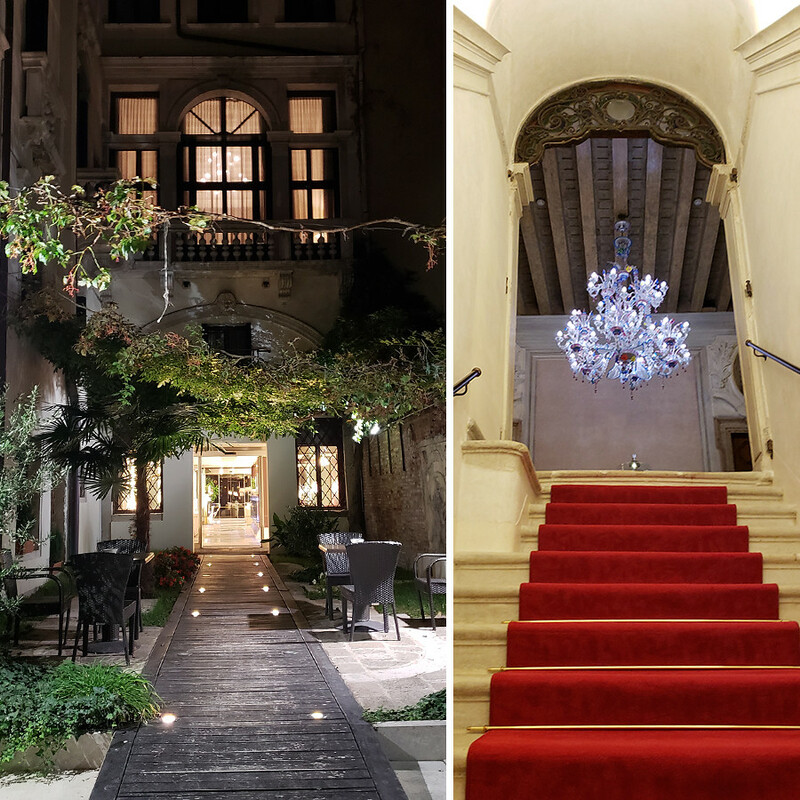 Our hotel, The Hotel Palazzo Giovanelli, was something else. Teresa, our friend the travel agent, gets special privileges sometimes because she refers her customers to luxury hotels like this. As her companions we got to take a sneak peak at how the rest of the world travels in style and let me tell you, IT IS QUITE THE STYLE! When I come back to Venice as a millionaire this is where I am going to stay. It was gorgeous AND very very old. It makes you wonder how many generations of nobility have stayed here and how many ghosts might haunt this place? Thankfully I didn’t encounter any ghosts but I did encounter many staff members who had impeccable manners. It was really a special treat. 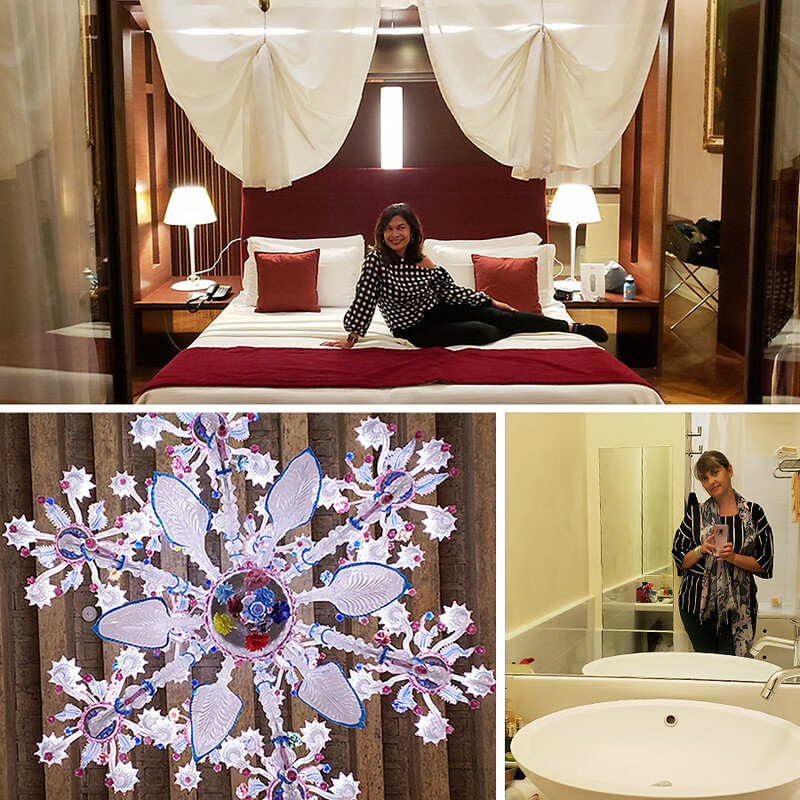 Pretty bed, pretty chandelier, pretty bathroom…Not too shabby! And our view was the courtyard that you see in the first hotel picture. That was our bedroom with a terrace over-looking the courtyard. I can only imagine how magical the view of the Grand Canal was. Swoon! So yes, we had a very nice stay there and no PTSD was experienced. The next morning we set out to see Venice by daylight. 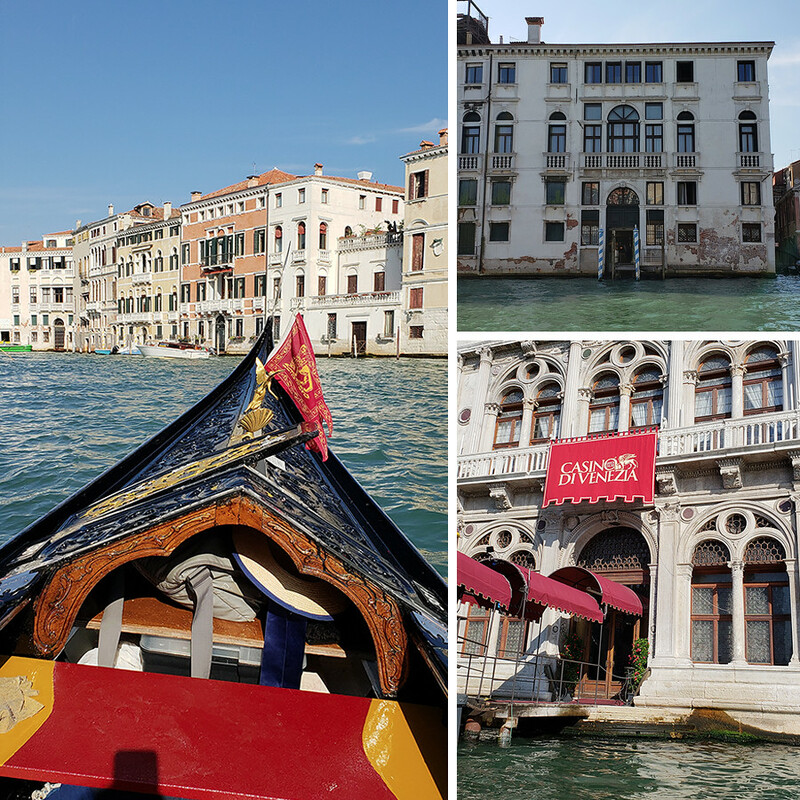 The first thing we did, and I highly recommend this, was take a gondola ride. You might think it is cliched and you could skip it but I would beg to differ. 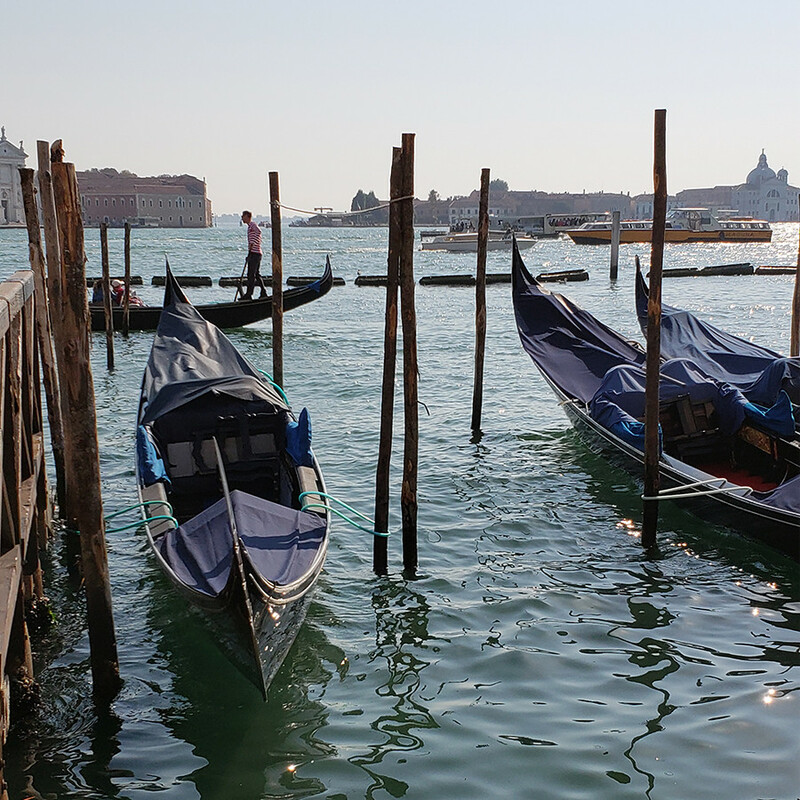 There is nothing like riding around in a gondola, experiencing the deftness of the gondolier first hand. They are masters of boat maneuvering! 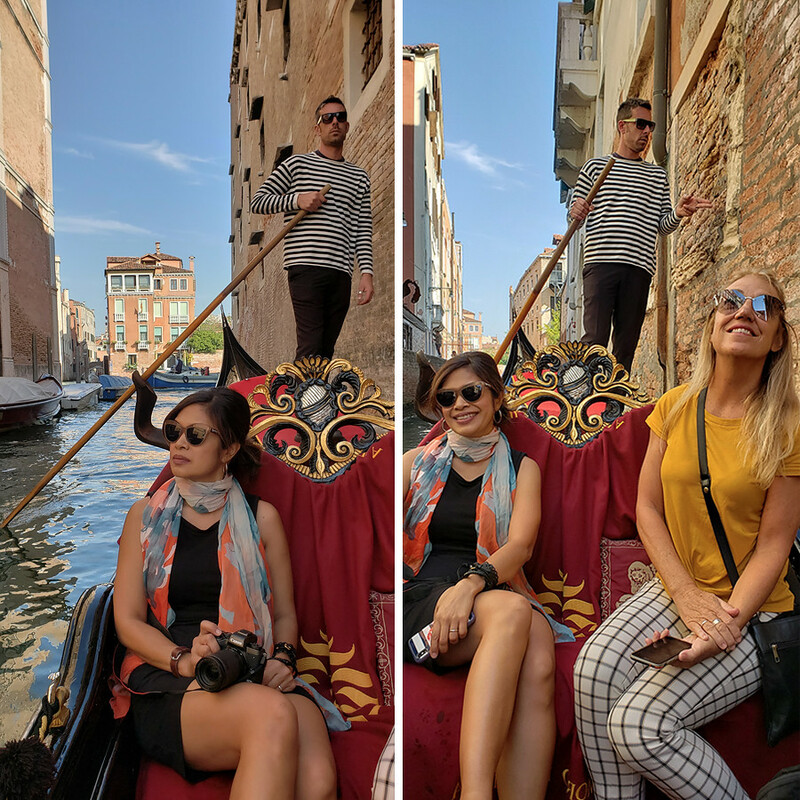 I couldn’t even believe how quick and clever our gondolier was. A little tilt here, a little nudge there, a quick push off a brick wall and a lean to the left and we were swishing by other boats with only a hair of clearance. 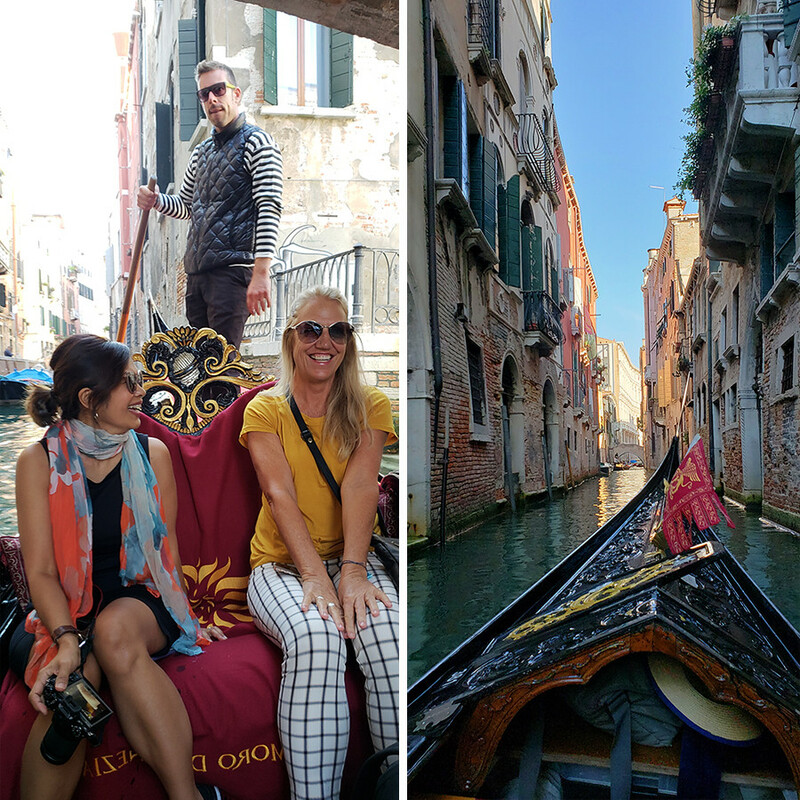 Our gondolier’s name was Pierre (of course) and he steered our boat in and out and around the tiniest canals filled with major boat traffic like he was walking down the street. That is what the water canals are to people who live here. Just another sidewalk! They grow up riding down canals (and falling in, Pierre told us) like it’s no big deal. It’s just a way of life. Can you imagine?!! We took a quick jaunt down the main canal and I was star struck. The open water, the buildings packed in together like sardines. Curves and lines, different textures and time periods all smashed together in a juxtaposition that made your eyes dizzy. Chapters and chapters of history all squished together before us. It was all just too much to take in! We obviously managed. 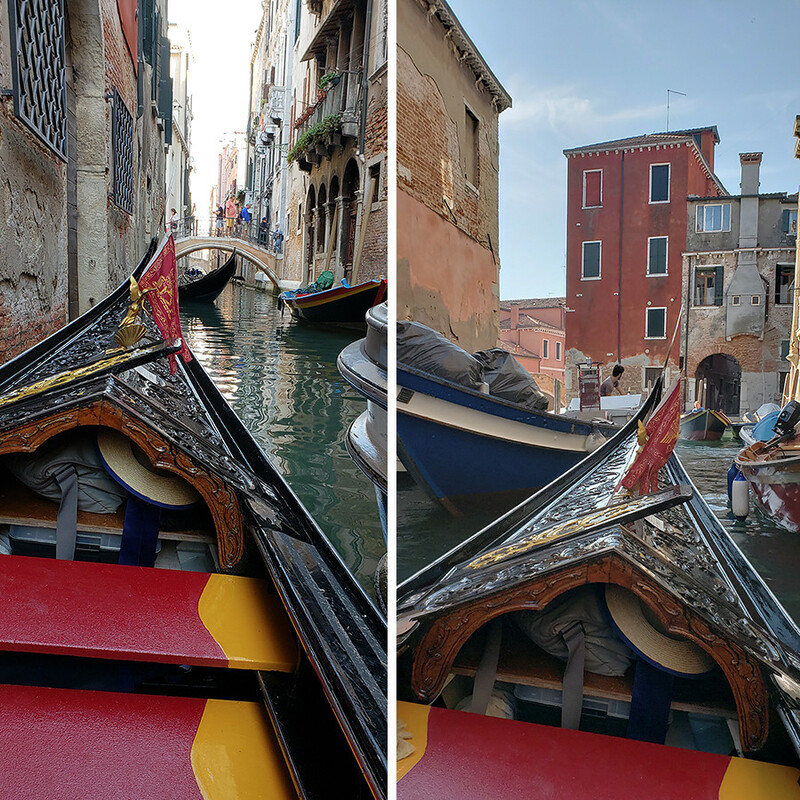 It might have been a blessing in disguise that I had my camera stolen in Milan because I could focus exclusively on taking pictures with my phone camera and I wasn’t fumbling around with equipment and accidentally dropping it in the water. I loved the small canals. There is stone everywhere. No dirt, no grass just lots and lots of marble and stone. 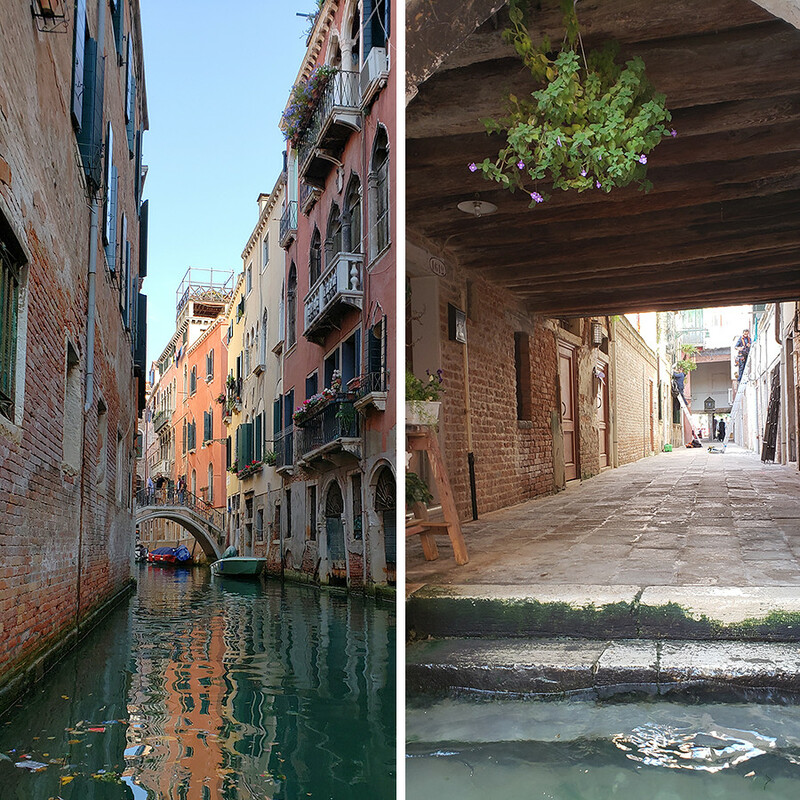 There is no rhyme or reason to the canals and where they streets and alleys connect. It’s like a giant maze. One alley will be narrow then it will off shoot into a larger street which dead ends in a canal… I did feel a little bit like a mouse in a maze with only my natural sense of direction to help me. The textures… everything is old and falling apart romantically! If only we could take some of this old world charm home and apply it to our bathroom that needs to be remodeled because the shower leaks. It just doesn’t work like that back home though. 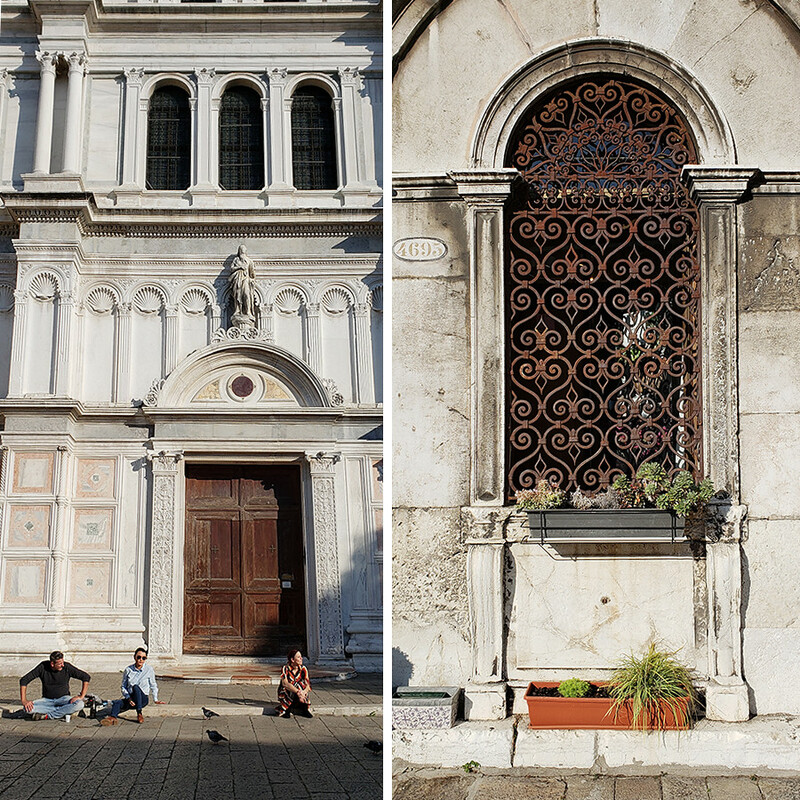 Old peeling paint and messily spackled cement is just not as beautiful as it is in Venice. 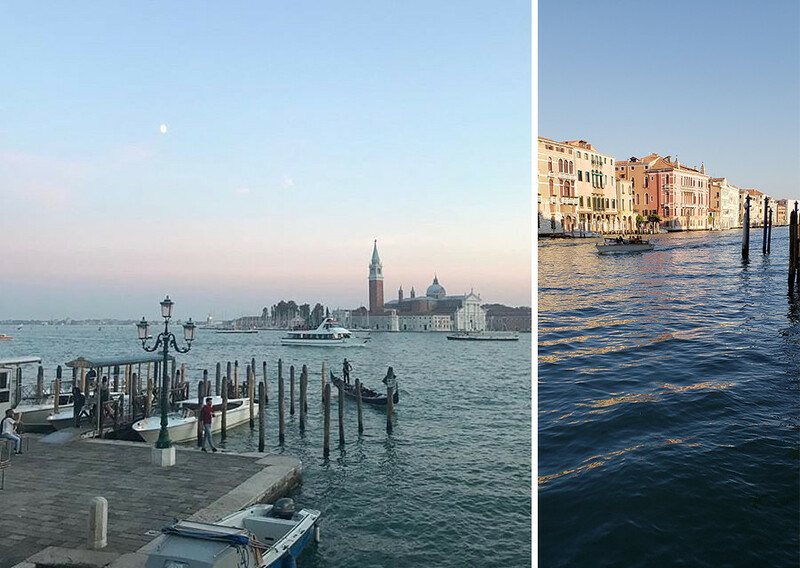 Oh Venice, you age so well…. As you can see boat traffic is a thing. But we never crashed once. Not even a scrape! 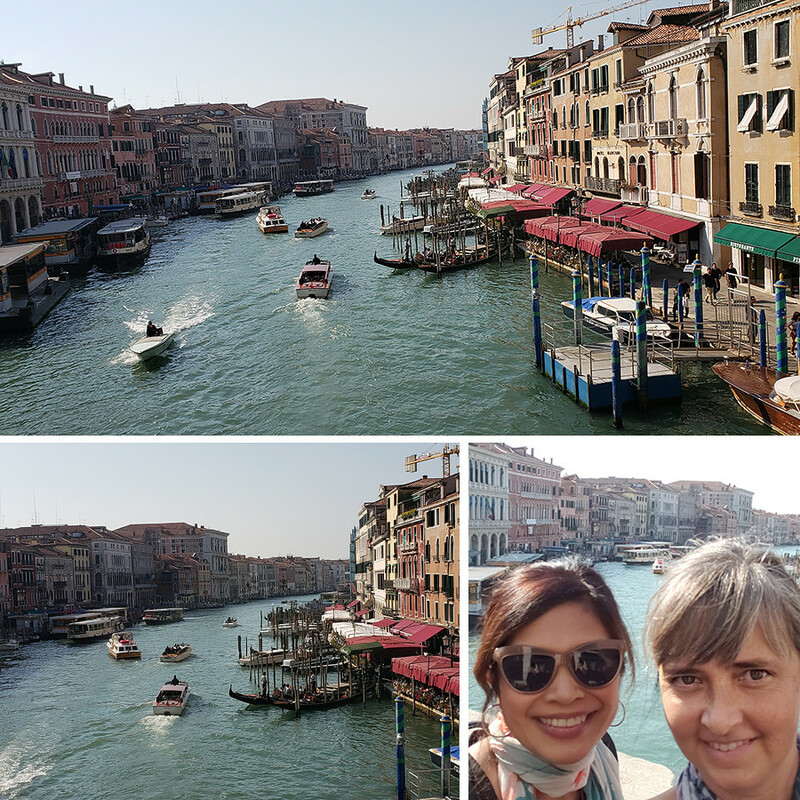 After the gondola ride we headed straight for the famous Riato bridge. Along the way we happened upon a fish market. 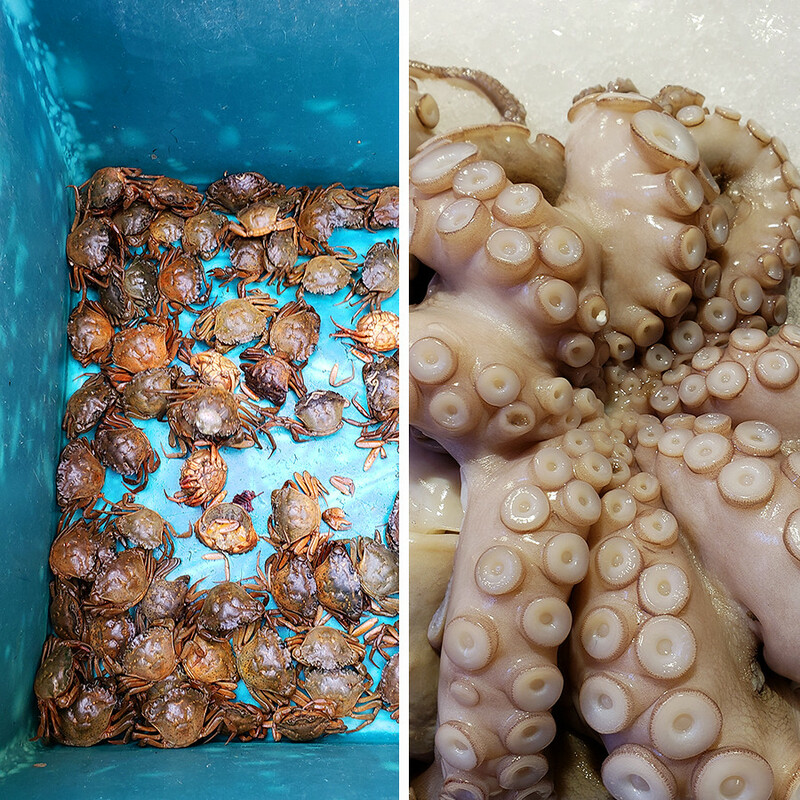 I had fun taking pictures of seafood that I would never ever eat. That’s the thing about me and visiting exotic locations on the sea. The local food is completely lost on me because I won’t touch it. I hate all sea food (except the very rare salmon sushi). Even seaweed grosses me out. So I pretend I am a vegetarian when I am visiting sea ports. It’s just easier. I don’t want to insult anyone over their cuisine. I’m sure it is very good. I just happen to have an aversion. 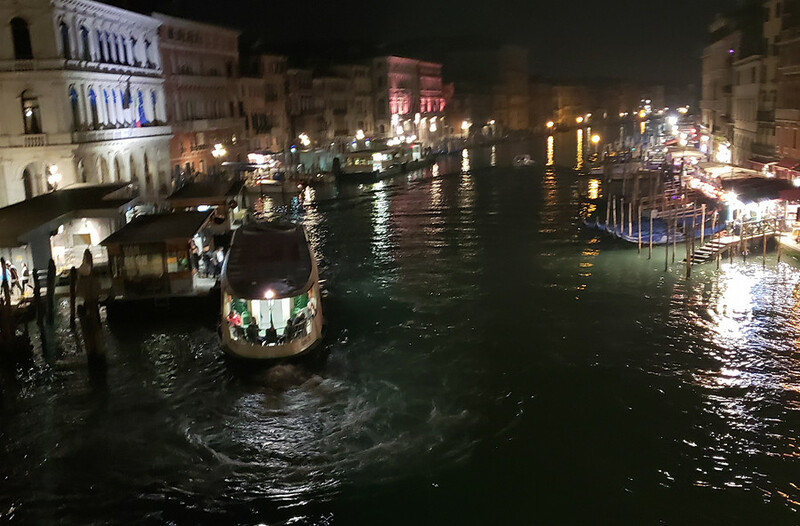 This is the view from the Rialto Bridge. It was crowded with tourists taking the exact same photos we were. We had to wait our turn to get a shot by the railing. But you can see why it is so popular. It’s very very pretty no matter how many times you see it. The wonderful thing about visiting Venice in October though is that it was only slightly crowded. Christine told us that in Summer it’s just one long line of tourists everywhere. I can see why the locals are so annoyed. It’s almost like they have to carry on their daily lives on the rooftops to avoid the crush of tourism. By summer standards Venice was a ghost town but by my standards it was just how I like it. Shoppity, shop, shop! So many things to see and buy. I did fall for a few bags of lemon risotto (that I completely flubbed up into mush when I got them home) and some tasty lemon salt. I did not buy a mask though. 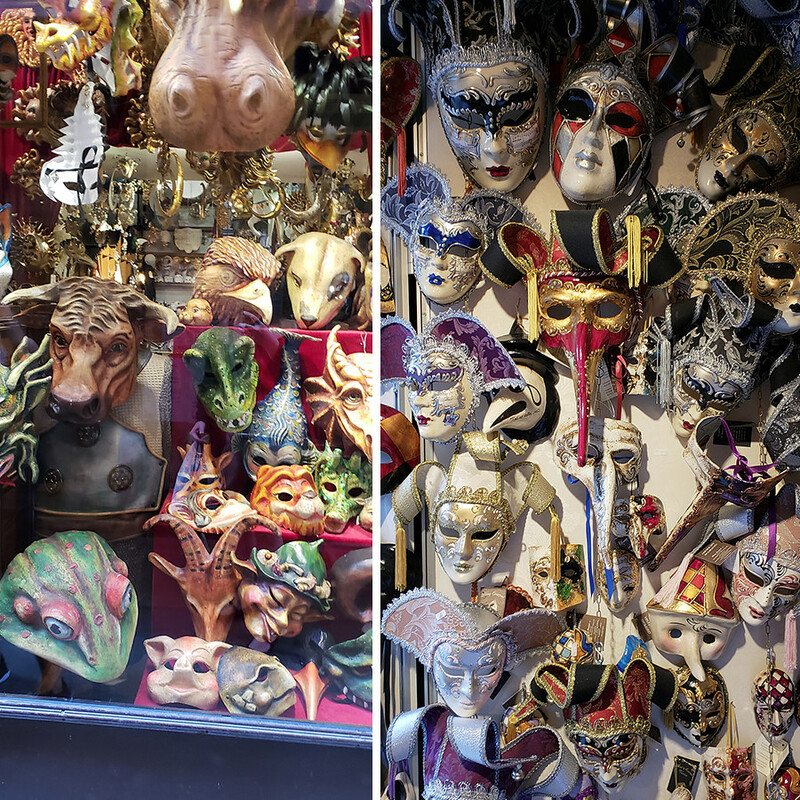 At this point my suitcase was already stuffed to it’s capacity (with homemade items from Varenna and Bellagio) and there was no way I could squeeze in a fragile mask. 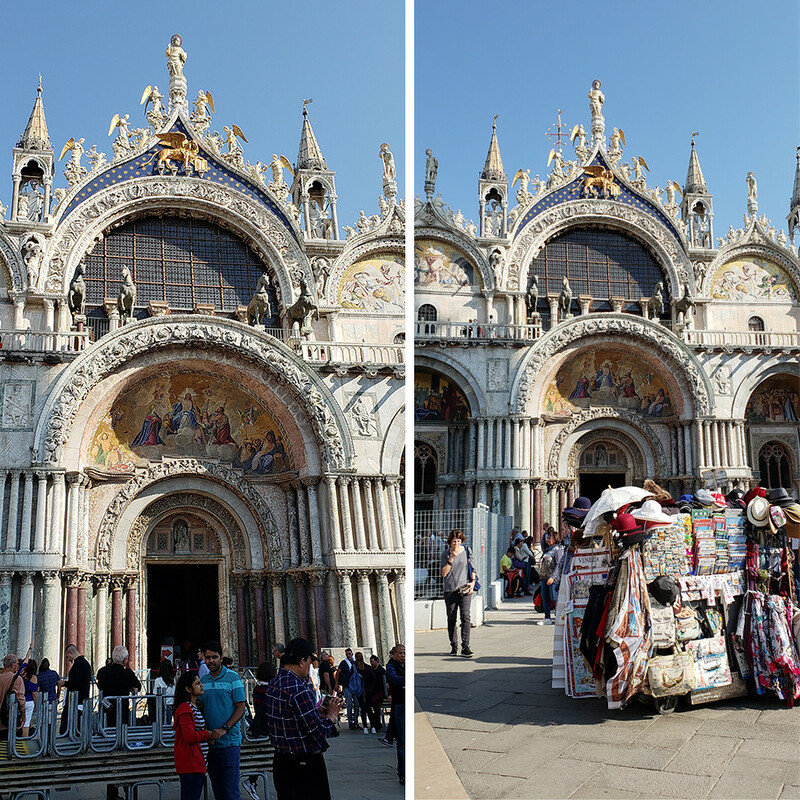 We visited St. Marks Square twice. Once all three of us and then Christine and I went back in the early evening while Teresa schmoozed with the hotel staff. The unfortunate thing about getting robbed was that the thief also took my phone charger so I was beholden on Teresa to share her charger. 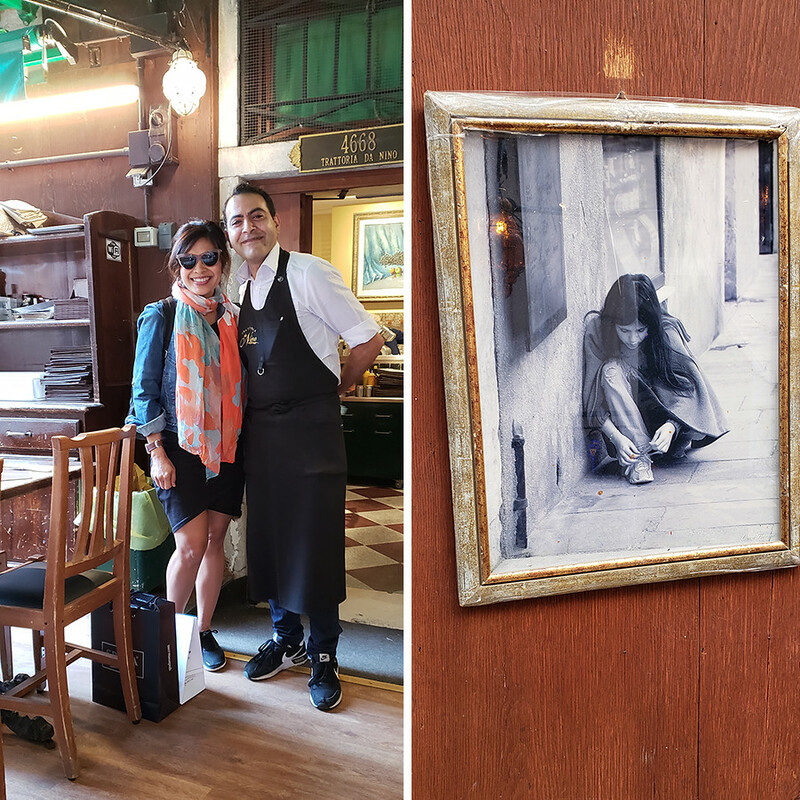 She was very generous but during the time I visited St. Mark’s Square during the golden glowing light of sweet time, my phone was stuck in the hotel getting charged. I should have bought a new charger but I didn’t think of that until the very last day, like an idiot. So I didn’t get to take any pictures of St. Mark’s Square during sweet time. But believe me, it was beautiful. We had the most lovely time sitting on the square drinking iced coffee and munching on biscuit cookies. It’s funny I’ve had biscuit cookies a million times but never fresh like they were here. I think the cookies I’ve had in the states are actually the same cookies except they are shipped from Italy and therefore stale! Tasting them freshly baked was out of this world! I spent time drawing in my sketchbook and enjoying the lack of a phone. Sometimes unplugging from your phone can be absolute bliss. Of course the documenter in me was aching to take photos but I was forced to just sit there and enjoy. At one point a group of older gentlemen started singing mountain folk songs in the middle of the square. They just stood in a circle of old men singing their hearts out. Their voices harmonized and echoed off the surrounding marble walls. I got the chills listening to them! And guess what? One of them was Christine’s cousin (or uncle, I’m not sure) so they had a little reunion and everyone got hugs. I felt like a local for a moment and vowed that when I get old I am going to join a singing group and travel the world singing. There is so much more to life! I see no reason to stay home watching television and getting depressed. We walked along the Adriatic Sea just taking everything in. 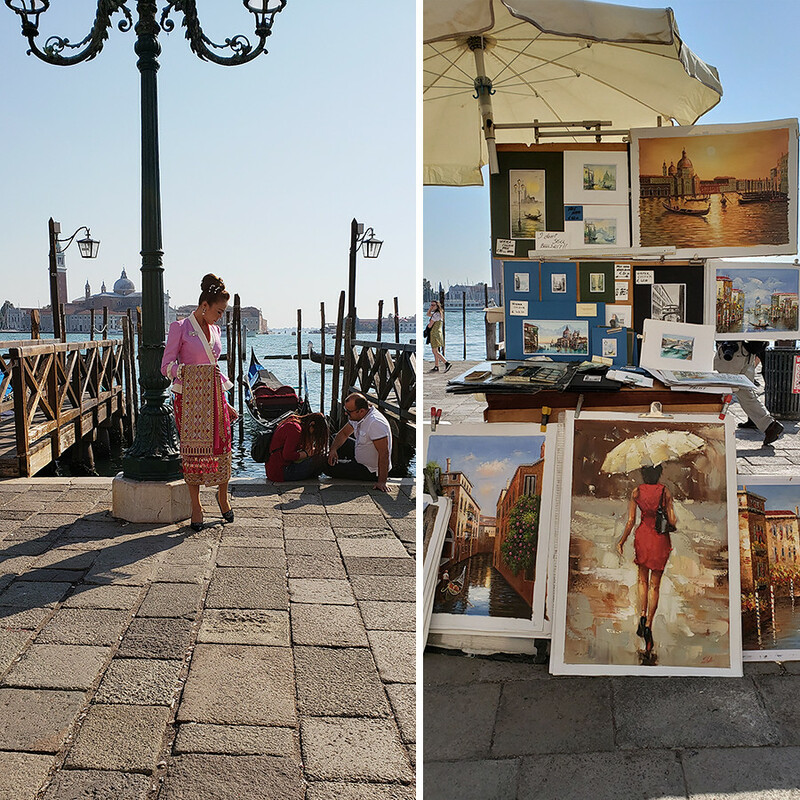 I saw a woman modeling, artists selling art, young back packers lounging, at one point a cruise ship even pulled in. It was all the different kinds of vacationers on display. 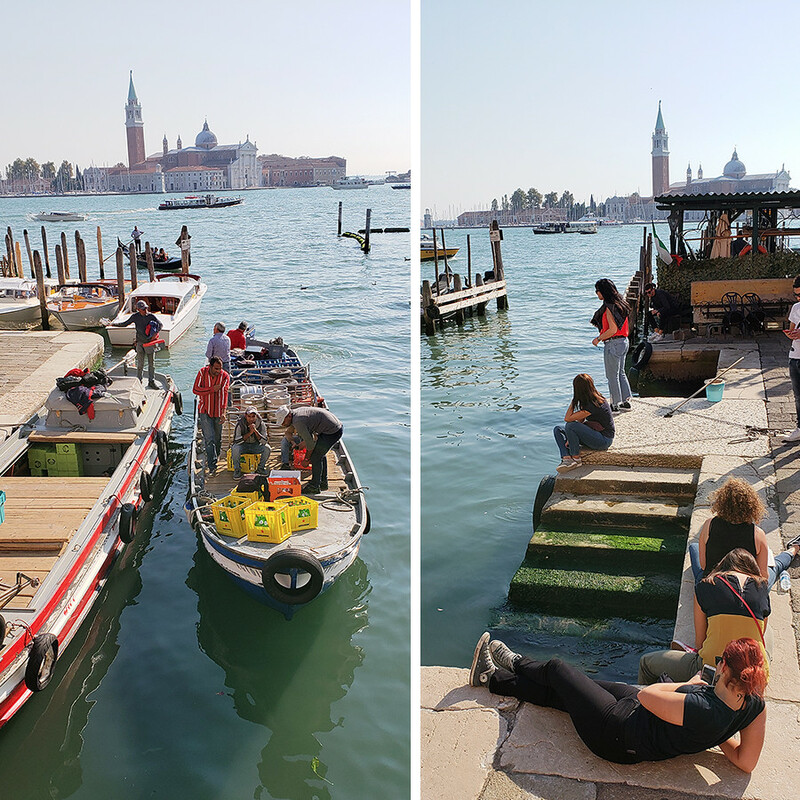 Everybody wants to see Venice and with good reason. I really love to take pictures of the locals though. 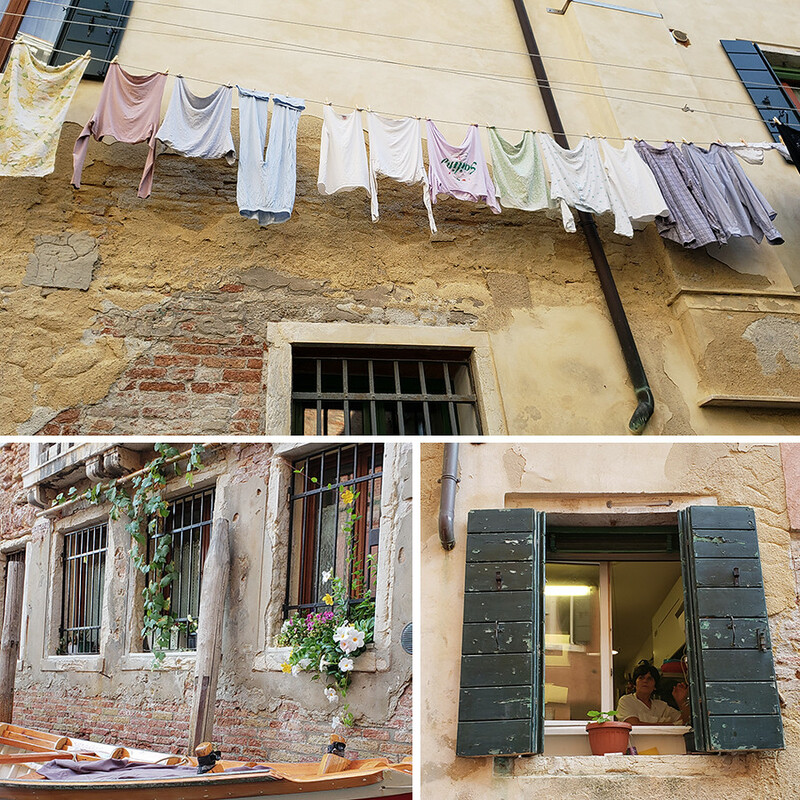 I like to pretend I am a National Geographic photographer getting a slice of the local life. If anybody wants to hire me as a travel photographer I am over here waving my hand enthusiastically. Pick me! I’m sure this photo has been taken thousands and thousands of times but it is so special to me because I was actually there. I can feel the warm breeze, I can hear the lapping waves, I can hear Christine calling me to speed walk to the other side of the island to see even more amazing things. 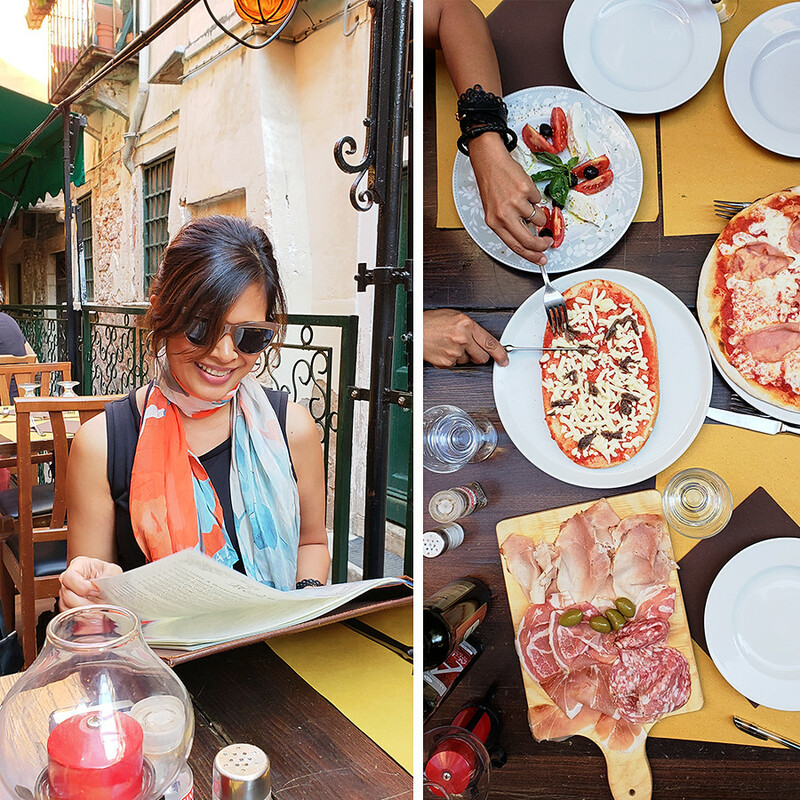 We had the best food in Venice. 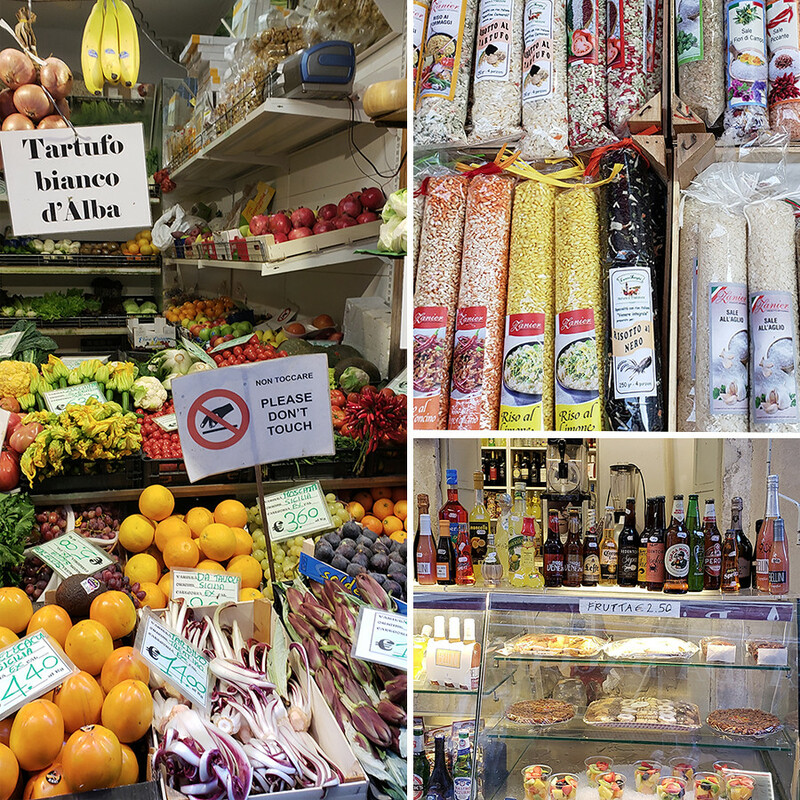 Pizza, Pasta Arrabbiata, Burratta Caprese and plenty of bottles of red house wine! I will never eat at Olive Garden again. Not that I was a fan anyway but soggy pasta is now dead to me. There is no reason to ever eat soggy pasta again. All the waiters flirted with Christine and Teresa because of course they are cute (duh) and their broken Italian endears the Italians. Everybody loves a tourist that at least tries to order in Italian. By the end of our trip I even picked up a few words. Italian is very similar to Spanish and by context I found that I could understand a lot. Speaking it not so much but I definitely got the gist of what was being said. Mostly, I love the rhythm and sing-song-y-ness of Italian. Everything has an upswing and a downswing when it is being said. I could copy it in a minute but unfortunately this is a blog and not a podcast. If you know me in person ask me to share how the Lake Como ferryman announces the destinations. It is unforgettable. Ah, locks! 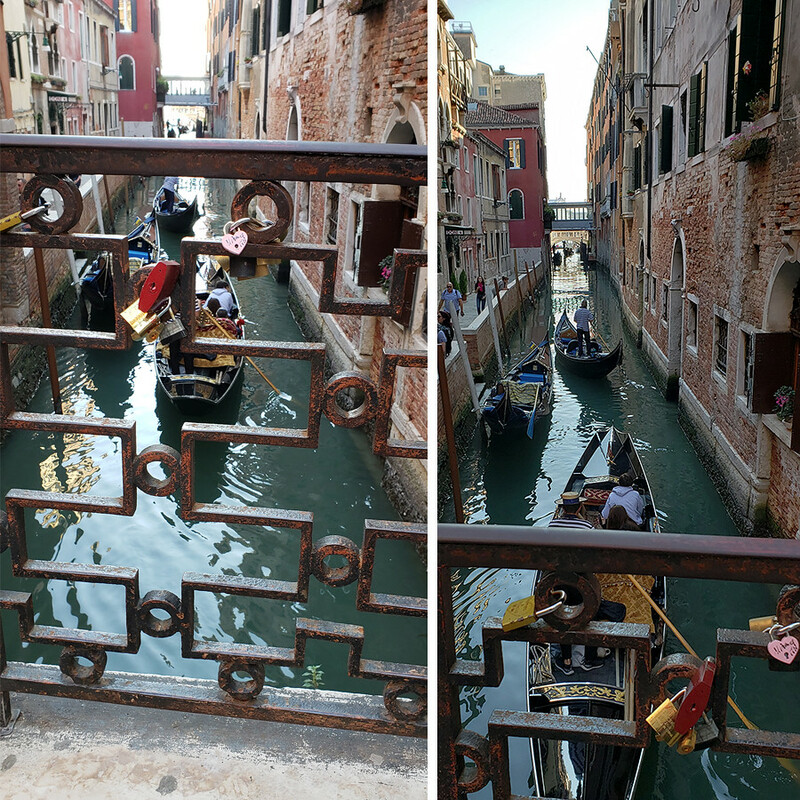 Not much to say about these but they were romantic like everything else in Venice. I am definitely bringing Payam back here someday. 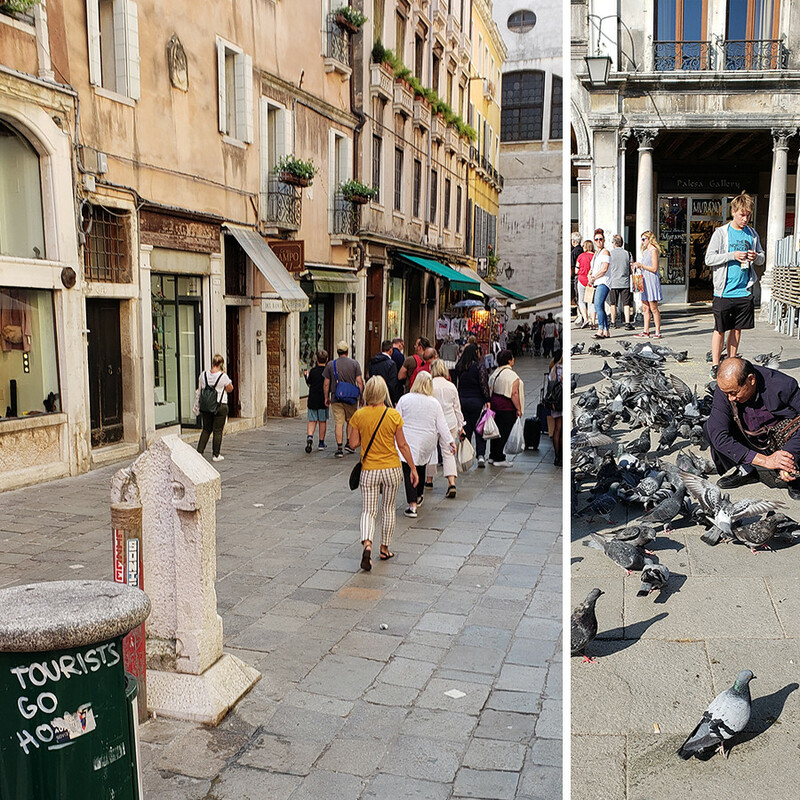 Payam was worried that it smelled in Venice and I don’t really think it did. It wasn’t fresh like a daisy or anything but the smell of the water wasn’t repellent. Just old and musty maybe but there was enough fresh crisp autumn air that I hardly even noticed it which reinforces my theory that fall is the best time to visit. 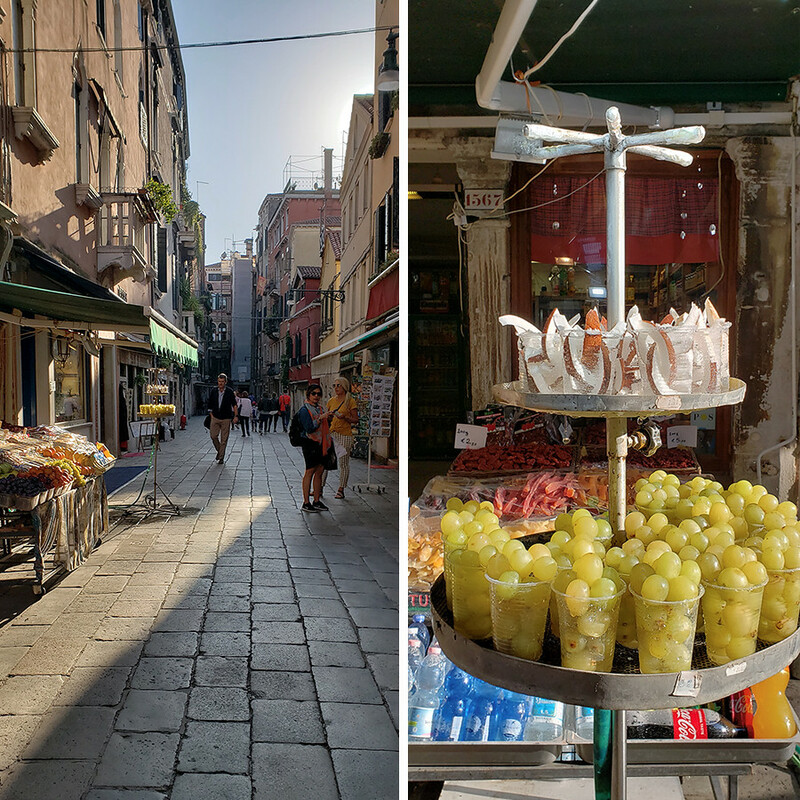 Venice is full of curiosities. Every which way we turned there was something new. Remember that coconut fountain? They have fruit cup fountains too! And windows. Windows and windows and windows. 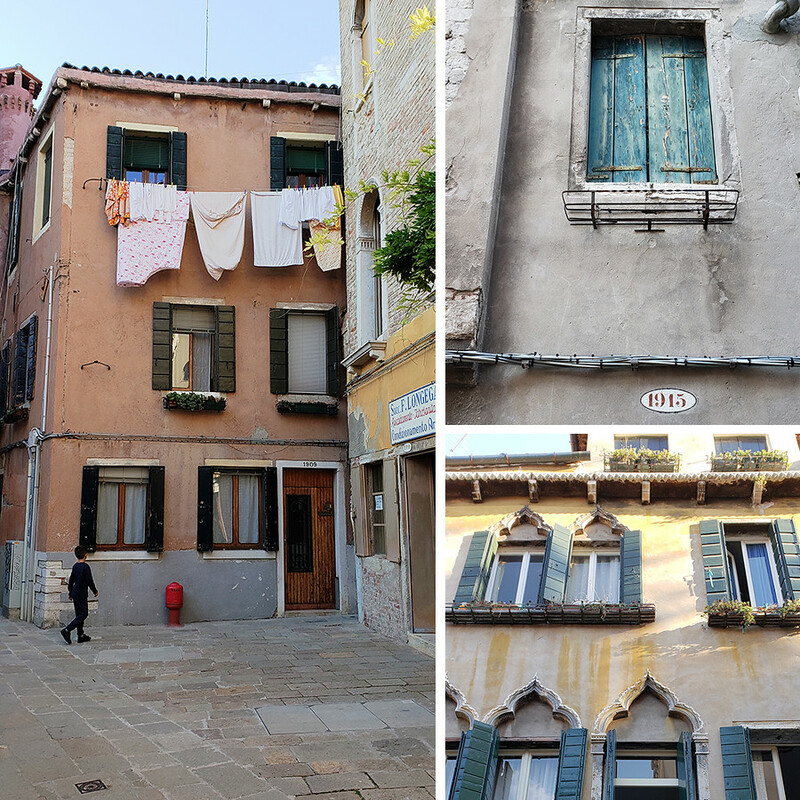 I could make a whole coffee table book full of photos of windows in Venice. Every single one unique and different from the last. No homeowner’s association rules here! 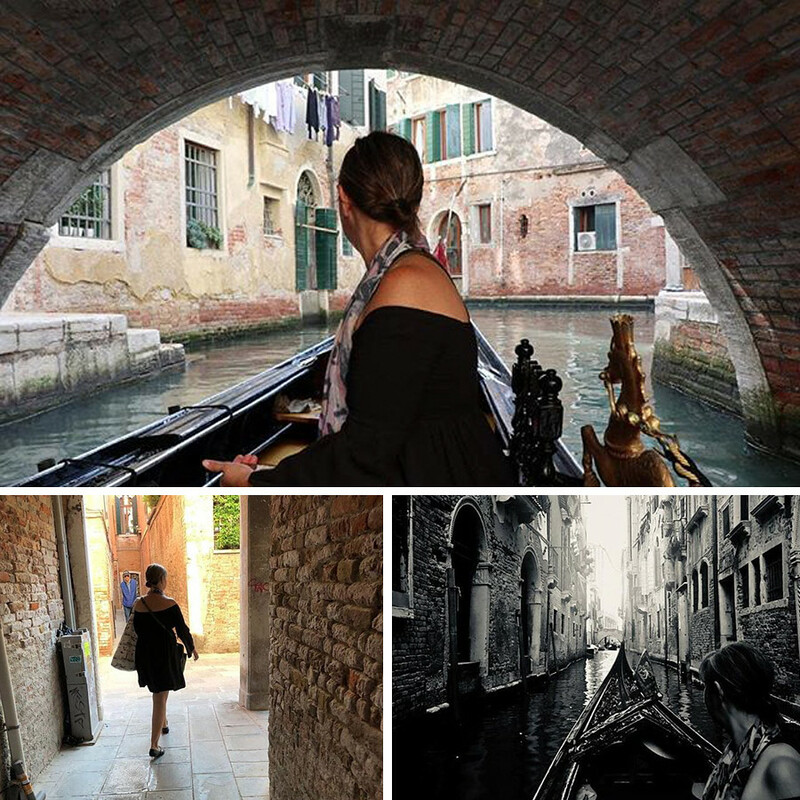 My travel mates took a lot of cute photos of me adventuring. Sadly, I don’t have high resolution copies of these images but I might have to track them down. I do love a travel photo of the back of someone’s head. It just makes you feel like they are going places. And I am! And then it was time to go. I kissed Venice an air kiss goodbye and promised that I would visit again.